I miss elementary school years when Valentine’s Day meant giving your friends and crushes a simple card and a lollipop. That was it. No pressure to get reservations at the hottest restaurant in town. No need to order flowers and chocolates to be delivered. No hoopla what so ever. It was just a holiday like Halloween (minus the costumes) which gave you reason to eat chocolate. But say you did want to go through the hassle of giving someone special a little Valentine treat. If you’re in the “like” stage, chocolate covered strawberries would be sweet. If you “really like” them, a dozen roses with the strawberries would be super thoughtful. 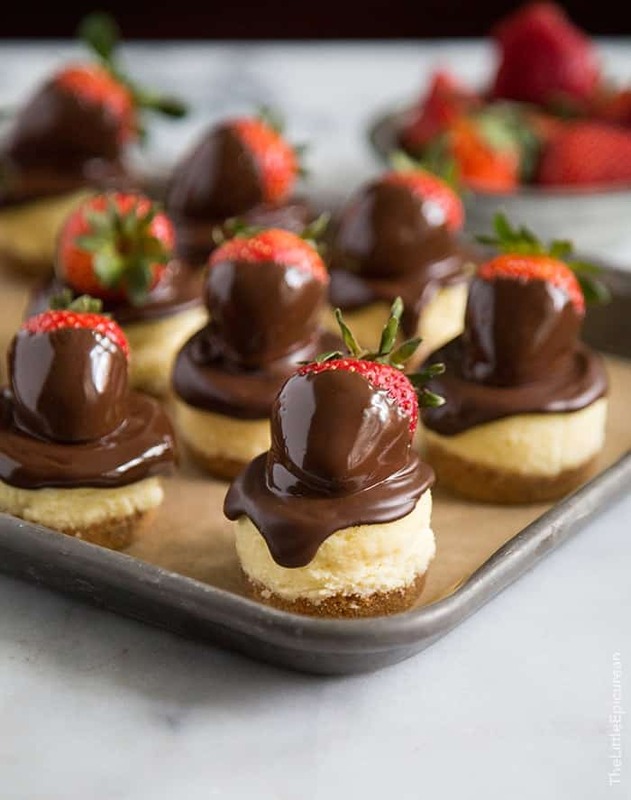 But if you’re head over heels, can’t eat, can’t sleep, totally in love with the person, well- you have to make them these chocolate dipped strawberry cheesecakes. 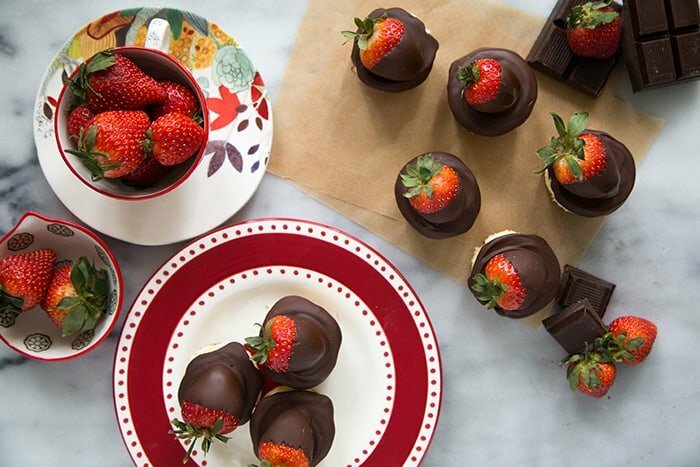 Once upon a time, chocolate dipped strawberries were enough. Nowadays, you have the option to top your strawberries with just about anything… sprinkles galore, nuts of all sorts, and any crushed candy you want. 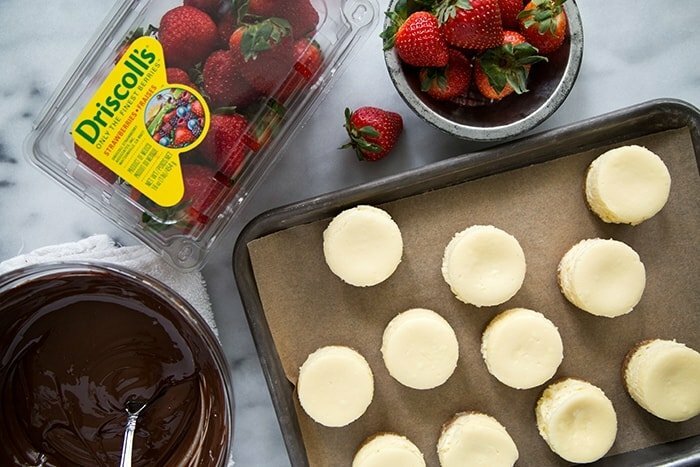 Driscoll’s has tons of ideas and inspiration for you to elevate the classic chocolate dipped strawberry. 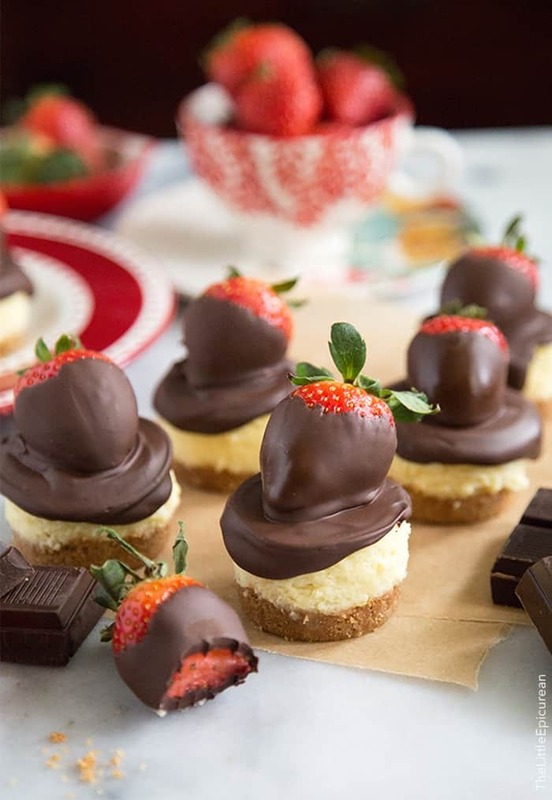 But in my opinion, chocolate dipped strawberries’ perfect match has got to be cheesecake. I used this mini cheesecake pan with removable bottoms to bake the cheesecakes. You could also bake the cheesecake in a regular 9-inch springform pan or several 4-inch springform pans. I gently melted dark chocolate in a double boiler (bain-marie). To prevent the chocolate from burning, bring to a boil a pot filled with about 2-inches of water. Remove from heat and then place a bowl of chopped chocolate over pot. The steam from hot water will gently and slowly melt the chocolate. This method keeps the chocolate in temper and allows the melted chocolate to set up quickly without the use of the fridge. Be sure to use good quality chocolate. Chocolate chips are suitable, but you’ll end up with a much thicker melted chocolate because chocolate chips have stabilizers and other added ingredients. This strawberry cheesecake is best eaten the day they’re made. As you can tell from the photo above, the chocolate hardens as it sits out. Combine ground graham crackers and melted butter. Spoon about 1 1/2 tablespoon of mixture into each mini cheesecake mold cavity. Use a tamper or cocktail muddler to pack crust into mold. Set aside. In the bowl of a stand mixer fitted with a paddle attachment, beat cream cheese until smooth. Add sugar while the machine runs on slow. Add eggs and yolk one at a time. Scrape down bowl as needed to ensure thorough mixing. Add vanilla and salt. Mix until smooth. Evenly divide cheesecake filling among molds. Smooth tops. Bake for 20-25 minutes. Cheesecake will puff up slightly during baking, but will flatten once cooled. Let baked cheesecake cool to room temperature in pan. Transfer to fridge and let chill for at least 1 hour. Once cheesecakes are chilled throughout, remove mini cheesecake from mold by pushing up on the removable bottoms. Spoon melted chocolate over each individual cheesecake. 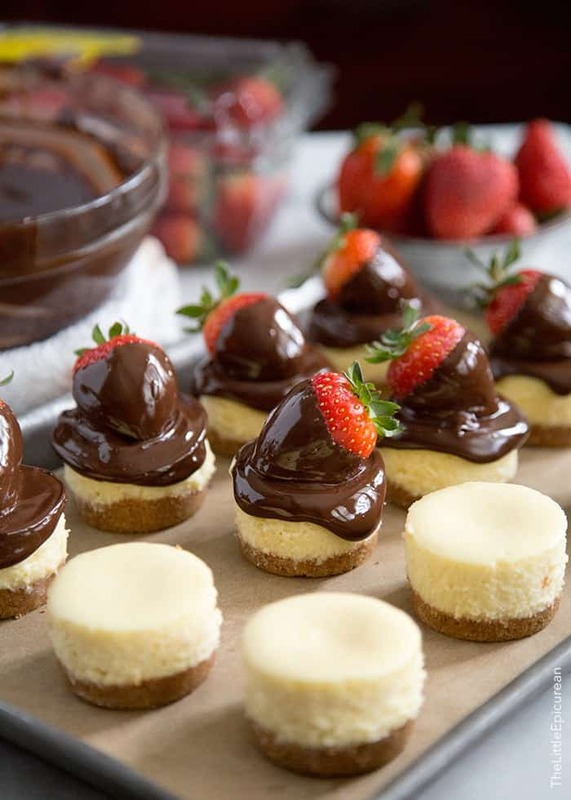 Dip strawberries in melted chocolate and place on top of chocolate covered cheesecake. Serve immediately. Over time the chocolate will harden and set. It is best to consume these desserts immediately. I used this mini cheesecake pan. Disclosure: Driscoll’s provided me with berries and reimbursement for ingredients. However, I was not compensated for this post. And as always, all opinions are my own. These little cheesecakes are so dainty and perfect for Valentine’s! I love the chocolate dipped strawberry on top! These are so sweet! I love your creativity, Maryanne! Maryanne, these are gorgeous!!! We are putting together those simple valentine’s day card right now. . but instead of lollipops, it’s all pencils, fake tattoos and this year, mini bubble things (like to blow bubbles). I love holidays more with the kids! We adults make things more complicated huh? :P I need to get a mini cheesecake pan stat. . just stunning!! love these! and Alex is a lucky guy! What if you don’t have tiny cheesecake pans? What beautiful cheesecakes Mary Anne. These look like the perfect Valentine’s Day sweet treats.. that I know I would LOVE to receive. Just wonderful! If someone gave me a dozen of these chocolate dipped strawberry topped cheesecakes, I’d assume they love me berry berry much. And I’d probably be their Valentine forever. Basically nothing beats a chocolate covered strawberry in my book. Unless there’s cheesecake involved. Hope you had a wonderful Valentine’s Day, you two! oh my god that looks scrumptious. cvant wait to try it… and just this morning I was wondering whther to buy a mixer or not…. definitely yes! I noticed this recipe yields 18, but your pan makes 12. How do you store the extra batter?? I have few pans because I serve these often at parties. If you are working with one pan, you can store the extra batter in the fridge until you are ready for a second batch. You can also use the extra batter to make one small 4-inch cheesecake. Can you use a cupcake tin for these? If you use a cupcake tin, you’ll have use paper liners to remove the mini cheesecake from the tin. I suggest the mini cheesecake pan because it has removable bottoms to allow for easy unmolding of the dessert. Im excited to make this recipe tomorrow! They look so good! Now the ingredients say 2 tsp vanilla and then 1 tsp vanilla extract. Is that a typo? Do you have to use a mini cheesecake mold or do you think you could use a cupcake or mini cupcake tin? The mini cheesecake mold makes it easier to remove from the tin. If you use a cupcake tin you’ll have to use paper liners to be able to unmold the cheesecakes. Hi, I don’t make videos at this time. These look so dainty and adorable! Have you thought of adding a little corn syrup to the ganache for shine? If so, do you know how much to add? Can the cheesecakes be made the day before and stored in the fridge? Would they be covered or uncovered? And then add the chocolate the next day? Yes, the cheesecakes can be made ahead of tine. Allow the cheesecake to completely cool before storing in the fridge (to avoid condensation in the fridge). I suggest keeping the cheesecake covered so it does not absorb any of the other flavors/scents in the fridge. Yes, I would recommend adding the chocolate the following day when you plan to serve it. I plan to make this in a pie plate (10 serving ready made graham cracker crust). How long do I bake it for AND do I need to adjust my measurements/ingredients? ?